• No more bending or stooping. 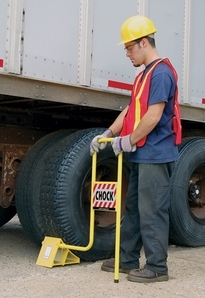 Aldon's ergonomically-designed "Walk-In" Wheel Block makes chocking trailer tires easy. • 36" high handle can be inserted on either side of the block. Handle with sign projects 23" beyond side of tire so truck driver in his cab and other workers can easily see that the wheels are chocked. For tires 33" - 42" diameter. Extruded aluminum with powder coat finish. Ribs on bottom minimize slippage. • Use on asphalt or concrete surfaces.